I hope all of you that celebrated Thanksgiving had a wonderful day. I know that I enjoyed the day; eating, enjoying being around family, and more eating. As I grow older I think I find myself loving my family more and more. I guess it is the fact that one never knows what tomorrow will bring. Now on to the recipe… I bought a new baking dish; it’s an 8-inch square pan. I haven’t owned one of these for a while, I am not sure what happed to the old one, maybe it was lost when we moved years ago. I have decided that it is time to down size a bit, before we know it we will be empty nesters and we definitely will not need the large pans of bars and desserts that I usually make. 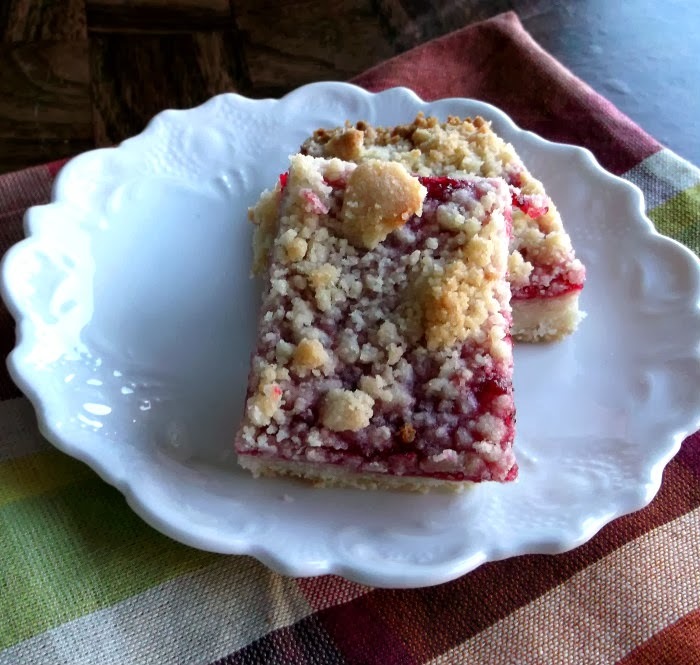 My first recipe that I decided to try with my new baking dish was this jam shortbread bar recipe. I have a tendency to bake a lot with chocolate and sometimes I need to remind myself that not everyone in the house is a chocolate fanatic like me. 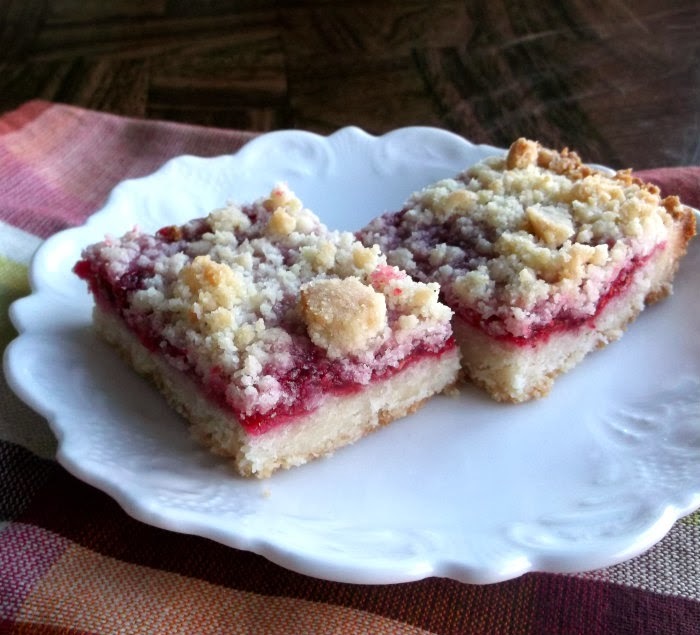 This is a simple shortbread recipe paired with your favorite jam. 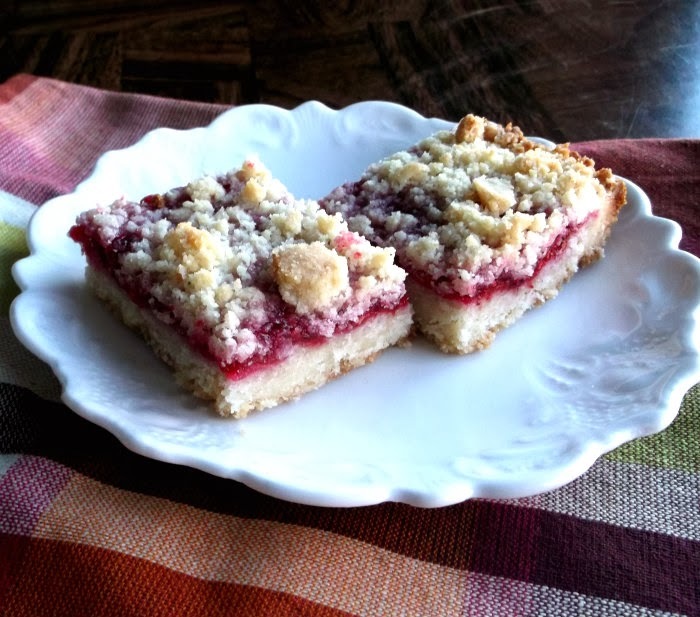 I love the crumbly shortbread and the sweet jam… so good. I changed a few thing on this recipe, the recipe called to put the dough in the freezer before baking it, wish I simply couldn’t wait that long. I am not sure what freezing would have done for the bars, but they turned out even though I deleted this step. Also there was not enough of the shortbread for the top so I added to the ingredients. For me the shortbread is the star of this bar and you need as much as you can get. 1. Preheat the oven to 375 degrees F. Lightly grease an 8-inch baking dish and set aside. 2. Whisk the flour, sugar, and salt in a bowl. Work in the butter with your fingers to make a crumbly dough. 3. Reserve 3/4 cup of the dough for the topping. Press the remaining dough into the baking dish. 4. Bake the crust for 10 minutes. Spread the jam over the crust, leaving a 1/2 inch boarder; crumble the reserved dough on top. 5. Return to the oven and bake until the edges are golden brown, 20 to 25 minutes. 6. Cool and cut into squares to serve. My brother HATES chocolate so I love finding chocolate-free options for him! These are perfect!! There’s just the two of us, but we still make large batches of stuff. We’ve learned to give away much of it – otherwise we’d eat it all, which would not be a good thing! This looks wonderful – thanks.